The term “Industry 4.0” refers to the combination of major innovations in digital technology that are poised to transform the way we work and is set to revolutionize the manufacturing sector. From advanced robotics and machine learning to the Industrial Internet of Things (IoT), these changes enable powerful new ways that will enhance processes, create new jobs that will lead to new levels of productivity, ultimately impacting business operations and the economic growth of a nation. Smart manufacturing or Smart Factory is a broad categorization that refers to the goal of optimizing existing manufacturing process, through the adoption and application of IoT, cyber-physical systems (CPS) and advanced human-machine interactions. Smart Factory takes current manufacturing practices to Industry 4.0 standards by transforming production lines into highly agile, efficient and automated lines that will eventually integrate into a smart logistics and service network. To prepare for the challenges of Industry 4.0, SHRDC has recently embarked on a new partnership with the Swiss Smart Factory (SSF) to provide practical solutions for technological progress and talent development. Part of the Switzerland Innovation Park Biel/Bienne, SSF is a R & D and test platform for industrial and applied research and innovation accelerators. SHRDC’s Industry 4.0 training program is known as the Malaysian Smart Factory (MSF) 4.0. It provides hands-on experience, training, technology and talent development for Industry 4.0 and Smart Factory competencies. These four areas are designed to support Malaysian industry in their adoption of Smart Factory practices and standards. Based on SHRDC’s ongoing engagement with industry, key players in the manufacturing sector acknowledge that the transformation process will likely create new competencies and roles, improve productivity and take the sector to higher levels of value and output. But they have also highlighted that the most crucial step is the application of Smart Factory competencies by trained talent to their existing production lines. 1. 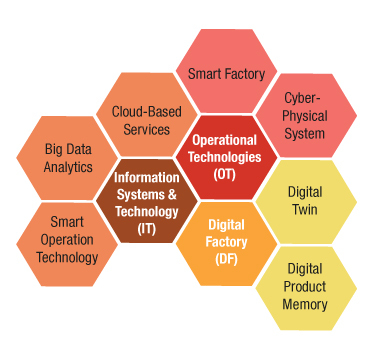 Smart Factory Technical Overview: Enabling Technology for Industry. We are also building our MSF 4.0 learning platform and have recently completed two proof of concept (POC) projects for Khind-Mistral Industries Sdn Bhd and New Hoong Fatt Holdings Bhd. In both POCs, the main goal is to enable the extraction, transmission, storage, retrieval and monitoring of relevant production data, from existing Plastic Injection Molding Machines (PIMM) that does not already have, built-in or installed internet ready capabilities. At New Hoong Fatt (NHF), SHRDC trainers, who are also practicing industrial System Integrators, collaborated with NHF’s staff to complete SHRDC’s first POC project. The outcome of the project demonstrated a palm-sized device that can be connected to a USB port that is available on an existing PIMM that is operating in NHF’s production floor. The POC device is capable of extracting and storing RAW data from the PIMM and can successfully proceed to decode the RAW data into a readable format such as a Microsoft Excel file. All the stored data residing within this POC device is made conveniently accessible wirelessly, after logging in with the proper security credentials, from any web browser within a computer or a smartphone. The web browser interface has been set up with simple Graphical User Interface, which gives the user options to view various types of reports related to NHF’s production requirement. By 2019, our 40,000 sq training centre in Shah Alam will feature a Smart Factory Laboratory with a Smart Factory Live Demonstrator area that will house various application equipment and offer visualization of technology at work. It will be made available to our members, industry partners, lecturers and students. Malaysia South-South Association (MASSA) is a non-profit business association, comprising members who are from the Malaysian business sector. The main purpose of MASSA is to promote trade and investment with developing South-South countries. It espouses the dynamic vision of the Malaysian business community and aims to enhance the global reach of its members. © 2013 Malaysia South-south Association . All rights reserved.